Steeped in history and famous for its French colonial influence, New Orleans has always had a magnetic draw for visitors. 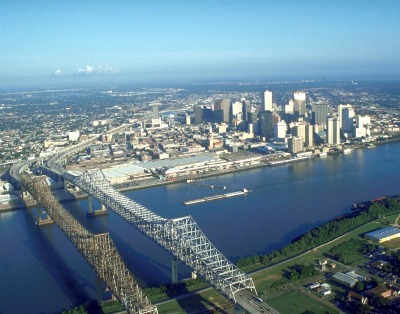 And the city has recovered marvelously from the destruction caused by Hurricane Katrina. Downtown is once again vibrant, the antique shops, fine restaurants and sporting venues are once again full, and the new cruise terminal located on the riverfront in downtown is first-class. 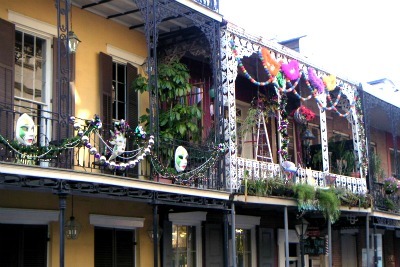 If you are thinking of taking a cruise to the Western Caribbean, how about mixing in a little Cajun, Creole and French culture and making New Orleans your departure point? It's the perfect way to kickoff your cruise or a relaxing - yet energetic - way to end it. Visitors to New Orleans on a cruise itinerary will find the new Erato Street Terminal adjacent to the Ernest N. Morial Convention Center. This modern dock facility serves vessels of the NCL, Carnival and other cruise lines, and there is easy access from the terminal to the Riverwalk shopping complex. Here you can find plenty of gift stores, clothing boutiques and a number of ATMs. Taxis can be found both at the shopping center or can be called for pickup at the terminal itself. One cannot visit New Orleans and not spend time in the famous and historic French Quarter, the area's main tourist attraction. Here you can find anything French, and along the popular Bourbon Street there is no end to the fine restaurants, shops and street performers. The jazz clubs are present on every block and the French Market is a must-see with its variety of produce, ready-made sauces, soups and spices. 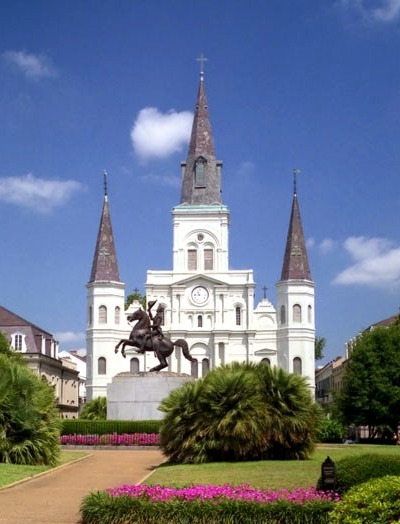 The beautiful Saint Louis Cathedral is worth two dozen photographs and the flea market is a delight for families with children. Everything from stuffed boa constrictors to voodoo magic necessities can be found here. And if you are in town during Mardi Gras, which is observed the week before Ash Wednesday, you are in for a real treat. Away from the French Quarter, visitors can take a stroll through the Garden District with its incredible mansions and manor homes. Close to it is the popular Magazine Street, with its never-ending antique shops, odd bookstores and small cafes. If you want to head into the wilds, check out the amazing Bayou Sauvage National Wildlife Refuge, the largest urban refuge in the nation. Just 20 minutes from downtown on Highway 434, this fantastic natural area has walking trails, boat tours and guided bird watching trips. If you've ever wanted to watch the experts craft a beautiful crepe on the backside of the crepe pan, over an open flame, it is suggested you head to New Orleans. The finest in Creole style cuisine, Cajun delights and the best Southern cookery in the nation is found in the many excellent restaurants located throughout the city. Popular with residents is the Cafe du Monde, with several locations in the central districts. Visitors will enjoy the fresh roasted coffee and snack items on the menu here. The famous "New Orleans Lunch", which is another way of saying that the meal can last all afternoon, is perhaps best enjoyed at Galatoire's at 209 Bourbon Street. Every type of soup and stew is offered along with plenty of bread, pan-fried shrimp and the largest choice of drinks in the city. And there are so many smaller establishments with emphasis on French, Cajun or Creole cooking that it would be impossible to mention them all. Taxis in New Orleans have set rates between the popular destinations. This includes to and from the airport as well as from the downtown area to the cruise terminal. The famous streetcars also have set prices and the destinations are clearly marked at the loading areas. The streetcars connect the French Quarter with Canal Street, with smaller branching lines running to the various neighborhoods. The Riverfront Streetcar leaves from the Erato Cruise Terminal and heads directly along the river and through part of the downtown. The weather in New Orleans is warm and sticky during the summer, and tends to be chilly and damp in the winter. However, visitors should be ready for both clear skies and rainy conditions at any time of the year. For those wanting to stay in touch or need Internet/WiFi connections, there are a good number of cafes that offer WiFi in the city. Most hotels have Internet access near the lobbies. The cruise terminal itself does not have telephone clusters or Internet connection facilities. 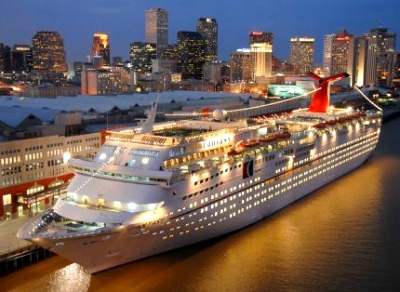 Cruise ship docked at New Orleans cruise port. A scene at Bourbon Street, the most popular street in the French Quarter. The beautiful Saint Louis Cathedral. The skyline of New Orleans at around 6pm.